6 Marketing Hacks That’ll Ignite Your Transition!! 6 Marketing Hacks That’ll Ignite Your Transition! 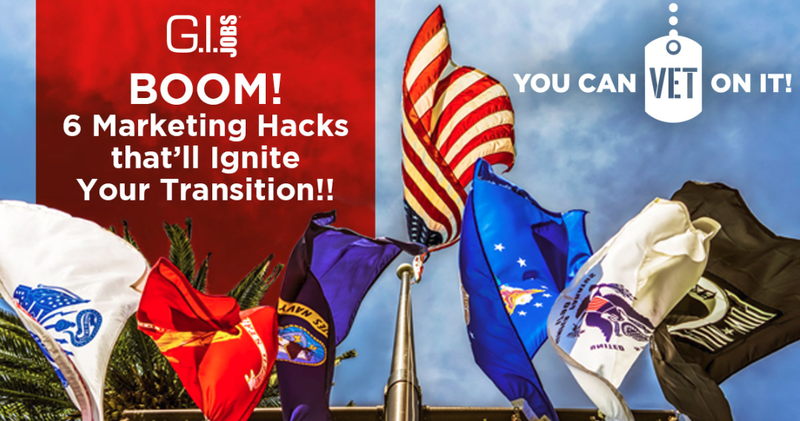 20 year Army Veteran, 1SG(R) Justin C. Pearson, shares 6 Hacks on Marketing yourself that'll ignite your transition! Why You Must Market Yourself NOW! There is an “Art & Science” to this process and every company treats their hiring process a little different. Since you may be looking for your next career, you must market yourself and network continuously until you have at least completed your onboarding process as a new company hire. This allows your voice to be “Top of Mind” and heard so that you’re not forgotten due to massive volumes of communications just for one job opening. I’m 1SG(R) Justin C. Pearson, I recently retired from the Army (1997-2017) and now I work as the Marketing Operations Manager as part of the G.I. Jobs Team here to serve you!! 1SG(R) Justin C. Pearson shares some magic dust that helped him land his dream job! Why does the interview process take so long? Organizations in general, are searching for the perfect candidate, the “Needle in the Haystack” and the mystical “Unicorn” that I’m sure you’ve heard of……..and will soon transform yourself into. Hiring for the “perfect fit” reduces the chances of bad hires and ultimately saves Employer’s time & money. Behind the scenes after your interview(s), you see I noted plural as in multiple interviews, there are many things that could be happening which could be resulting in why you haven’t heard back. This is why the interview process can be prolonged. What qualities should I highlight for Employers to get EXCITED about me? Your Motivation & Passion- This shows who you may be in the workplace. It also shows your creativity and willingness to learn and improve. Your Professional Commitment- Learning about and researching the company, its culture, the mission statement, values, networking with employees, and taking the initiative to provide solutions before expected! Your Beliefs, Values & Goals- Aligning & Communicating who you are to said employer, Will you fit in? Will they enjoy your presence? How does the employer’s culture match your wiring? How are you proving all this to them? 1st HACK- What’s your Message to the World? Determine your personal Unique Selling Proposition (USP)– You do this by identifying your unique skills, knowledge, and experience that you WILL bring to the table that others may not have. Bottom line, you MUST differentiate yourself from every other candidate in the pool in order to stand out! You MUST commit to this new way of communicating- We’ve all heard of outside of the box thinking, right? Becoming Socially Savvy? This is exactly the way that you must think about this whole process. From the way you talk about yourself, to the many different communication platforms, you can choose to communicate and market your message in so many unique ways to differentiate yourself from the crowd. This whole process most likely will make you uncomfortable because it’s all new, but don’t let that be the roadblock that holds you back. Now is the time to commit to making a plan, refining the plan, evaluating it, and sticking to this life-changing approach! You ARE good enough for the position & You do have what it takes- Be confident! It takes time to highlight yourself, so this should be a huge part of your plan- remember quality vs. quantity- The more your networking is targeted the more you’re able to target your network with your great niche content. Elevate your personal brand by creating leader thought through “niche content” that is educational and fun. By doing this, you are sharing your expertise and building relationships at the same time, which assists other professionals within your network in reaching common goals. We all want everyone to love our message and content right? Understand that there are millions of posts a day from professionals with the same goal, so ensure what you do publish or post is high-quality, varsity work that’ll HELP others! Your work MUST grab one’s attention, stop them in their tracks, and make them want MORE….heck even message or call you……………..well that’s the goal anyway! Learning to become a Social Media & Communications NINJA is HARD work- You may only be used to communicating through your .mil outlook email or a Google/Yahoo account. Well, it’s time to broaden your horizon and start researching the different ways you can communicate your message. YouTube will become your “Go-To” aid in order to educate yourself on the “How-To” of using all of these different platforms. The important piece to understand here is everyone uses different platforms to take information in. Heck, you can tweet me and I’ll probably respond within a day, but if you send me a LinkedIn message it may be a few days until you get a response. Using variety in the ways you broadcast your message is important because not only do you want your voice heard, but you want your message amplified! Dominate by being omnipresent on multiple social media & communication outlets! Let’s just be real- you must take MASSIVE action to get noticed! There are millions of posts a day and free organic reach on social media gets smaller and smaller by the minute. Back in the day, I called my efforts the #DAILYGRIND in order to achieve #SUCCESS- if you commit to getting after it you’ll inch closer to the “Dream Job” or “Goal” you’re focused on! Sometimes we set unattainable goals that aren’t exactly realistic. Take the time to determine your efforts align with the goals you’ve set because it will take massive action in order to meet your expectations and dreams…..trust me on this one- plan accordingly, hustle daily, and if need be, extend your days by a few hours…………who needs sleep right (lol)? These HACK’s that I’ve shared with you today are the magic dust that helped me land my dream job! I’m Blessed and Motivated daily to be able to assist you in your life adventures! Don’t forget to Sign-up and Join the Ranks to get our weekly tips, tricks, and resources that provide opportunities for you! LIVE: BOOM! 6 Marketing Hacks that’ll Ignite Your Transition!! LIVE: How to Network Like a PRO: 9 Secrets to Help You Dominate!! Our 20 year Army Veteran, 1SG(R) Justin C. Pearson and currently the Marketing Operations Manager at G.I. Jobs, shares 6 Marketing Hacks That'll Ignite Your Transition! Why You Must Market Yourself NOW! Find employers that want you NOW!